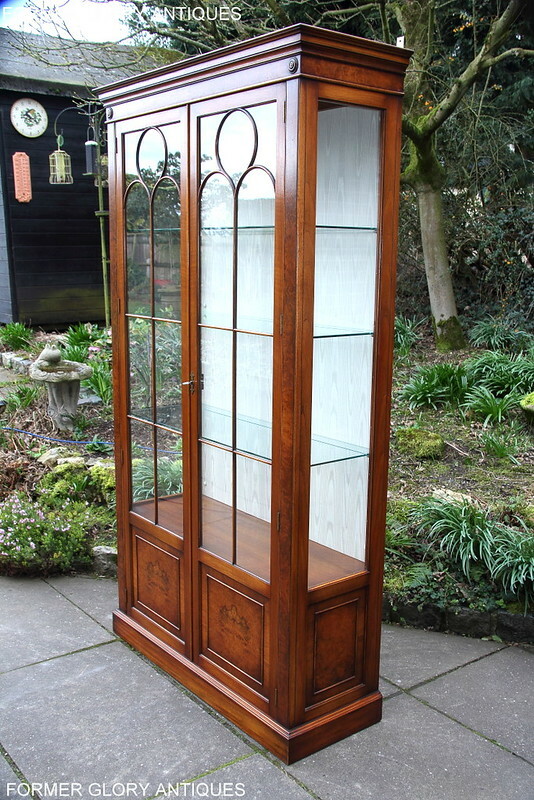 A VERY ATTRACTIVE, LATE 20th CENTURY, 'BURR-WALNUT', DISPLAY CABINET, OF EXCEPTIONAL QUALITY AND CONDITION. THIS FABULOUS CABINET IS ENGLISH MADE BY ONE OF THE LEADING FURNITURE MANUFACTURERS IN TODAY'S MARKET PLACE. 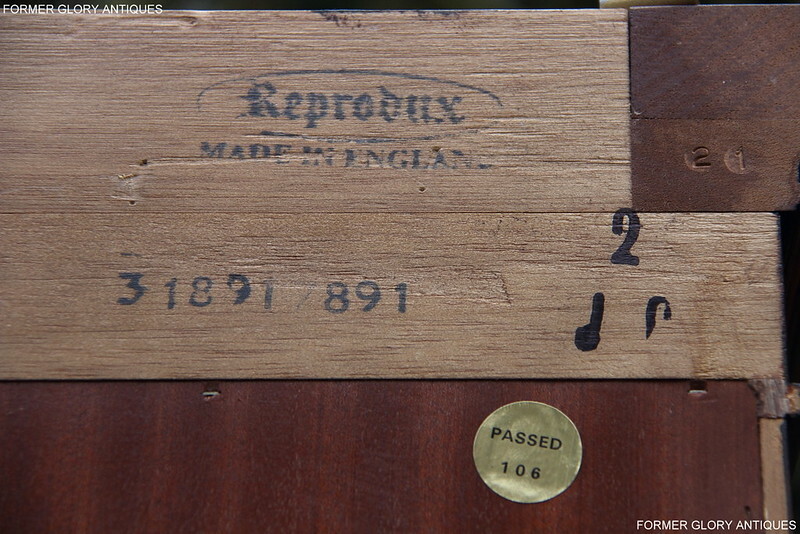 IT IS THE FAMOUS 'BEVAN FUNNELL', 'REPRODUX' FURNITURE COMPANY, OF NEWHAVEN, EAST SUSSEX, ENGLAND. 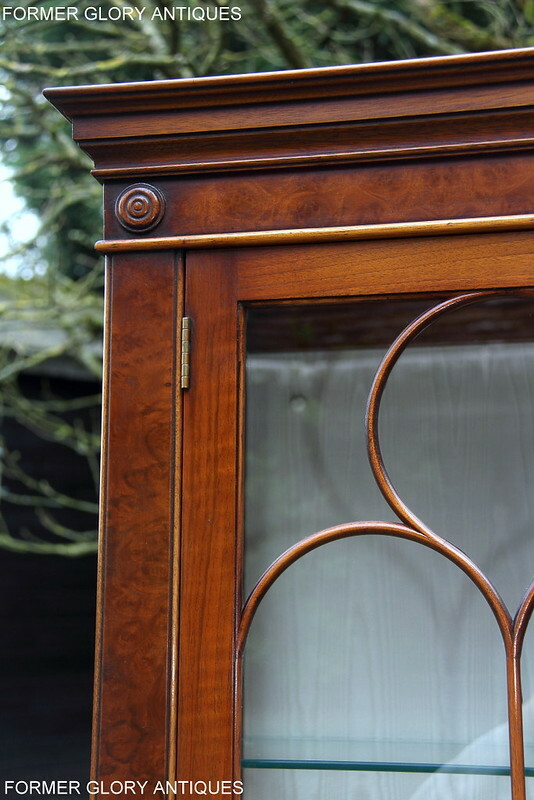 THE CABINET IS MADE IN THE TRADITIONAL 'GEORGIAN STYLE', USING ONLY THE VERY BEST QUALITY TIMBER, VENEERS AND FINISHES AVAILABLE. 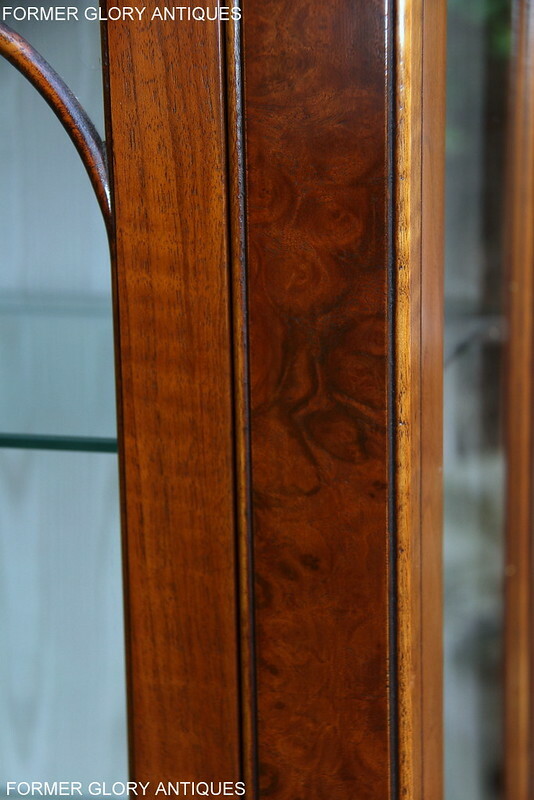 IT HAS ATTRACTIVE 'BURR-WALNUT' GRAINING THROUGH-OUT AND WOULD SIT NICELY WITH OTHER MATCHING 'BEVEN FUNNELL' 'REPRODUX' ITEMS OF FURNITURE. 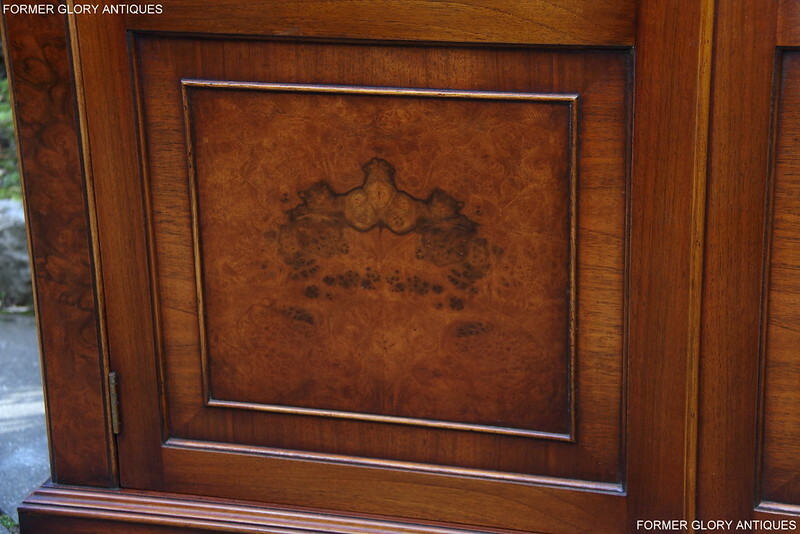 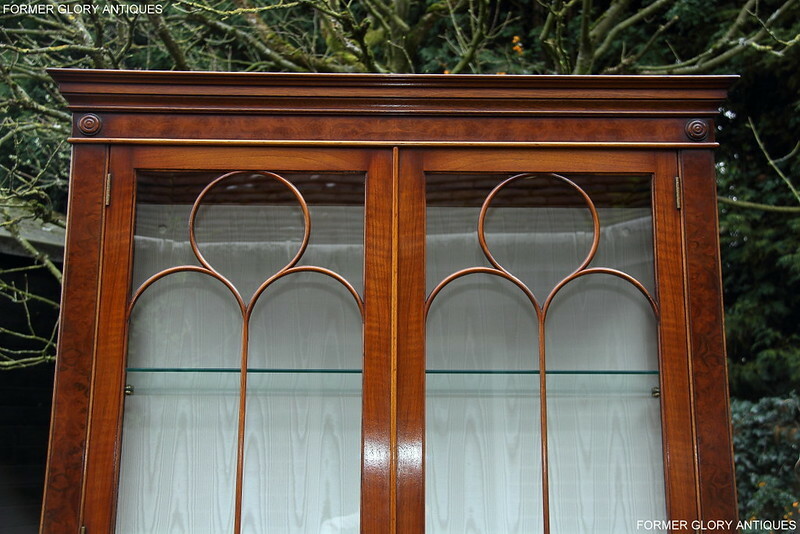 THE CABINET HAS A DECORATIVE TOP CORNICE WITH A VERY ATTRACTIVE BEADED 'BURR-WALNUT' FRIEZE BELOW, WITH ADDITIONAL CIRCULAR CORNER DISC MOULDINGS. 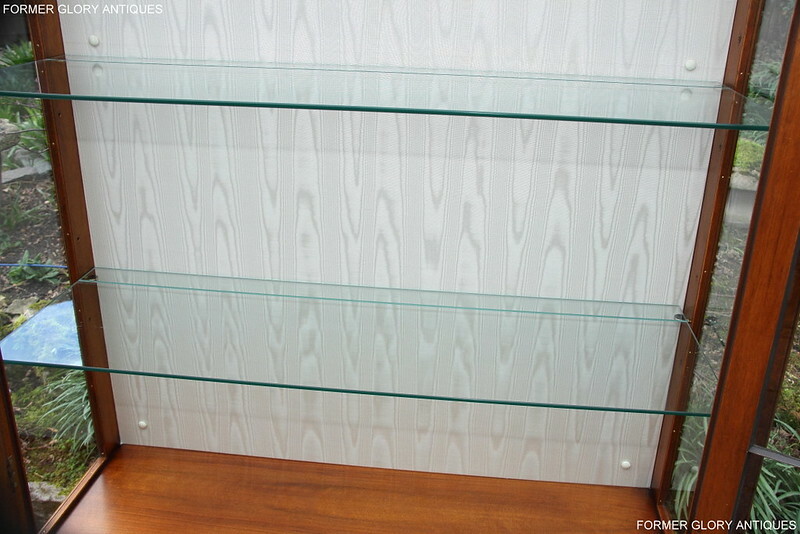 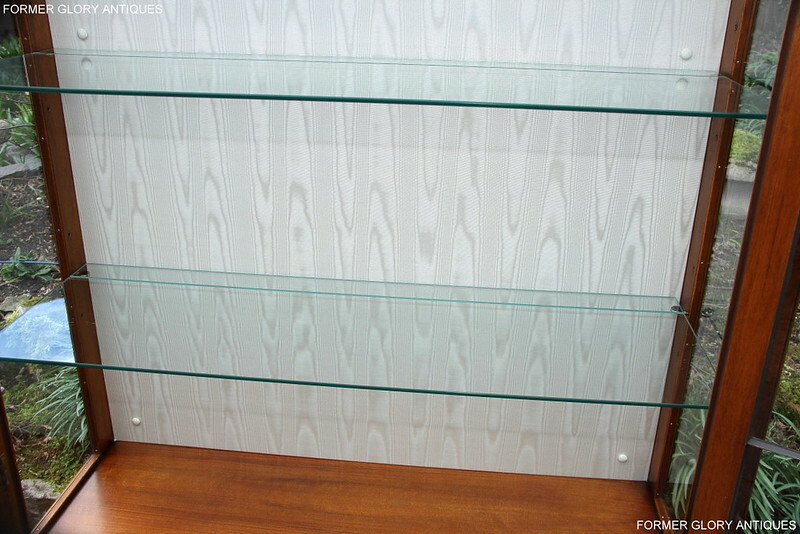 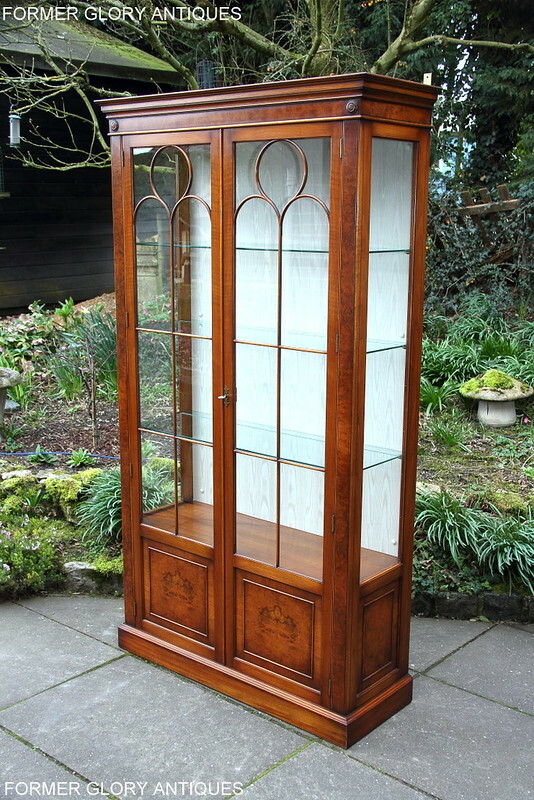 THERE IS A VERY USEFUL DISPLAY CABINET SECTION AT THE TOP, WHICH HAS THREE LARGE ADJUSTABLE, PLATE GLASS SHELVES INSIDE, MAKING THE CABINET IDEAL FOR DISPLAYING PURPOSES. 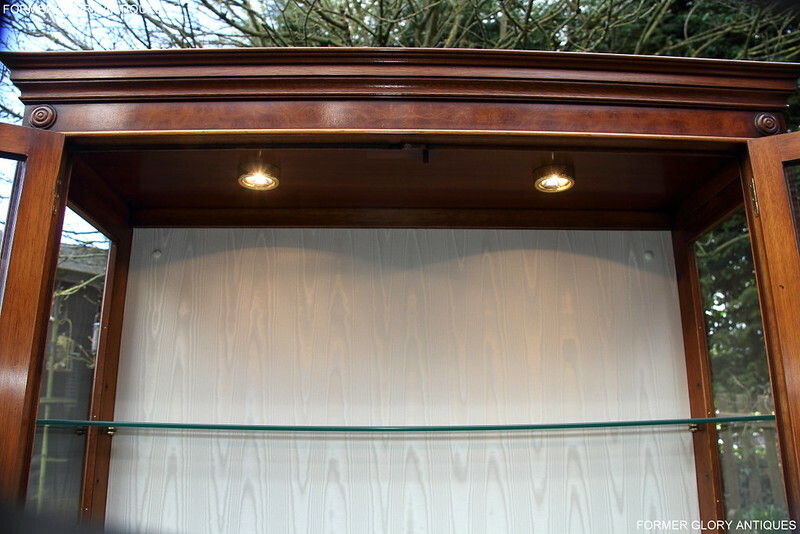 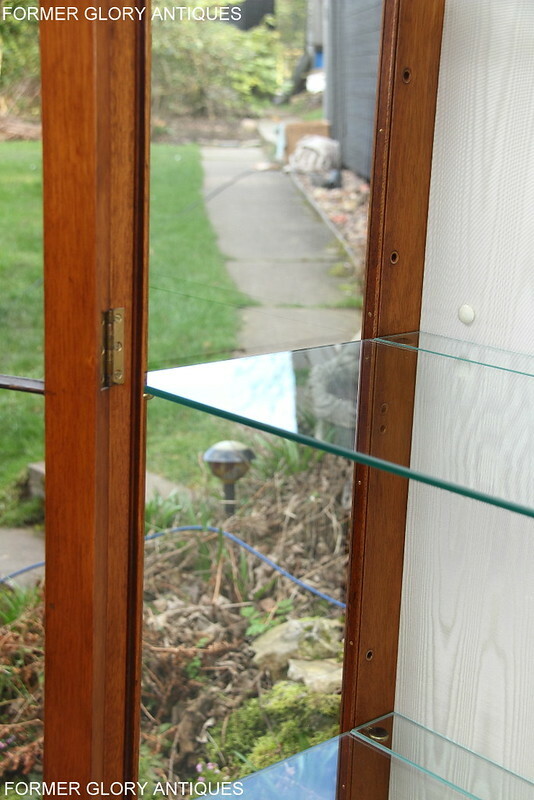 THE THREE GLASS SHELVES ALL HAVE A PLATE STAND GROOVE CUT INTO BACK AND THERE ARE TWO ADDITIONAL 'SPOT-LIGHTS' FIXED IN THE TOP OF THE CABINET SECTION, AGAIN MAKING IT IDEAL FOR DISPLAYING PURPOSES. 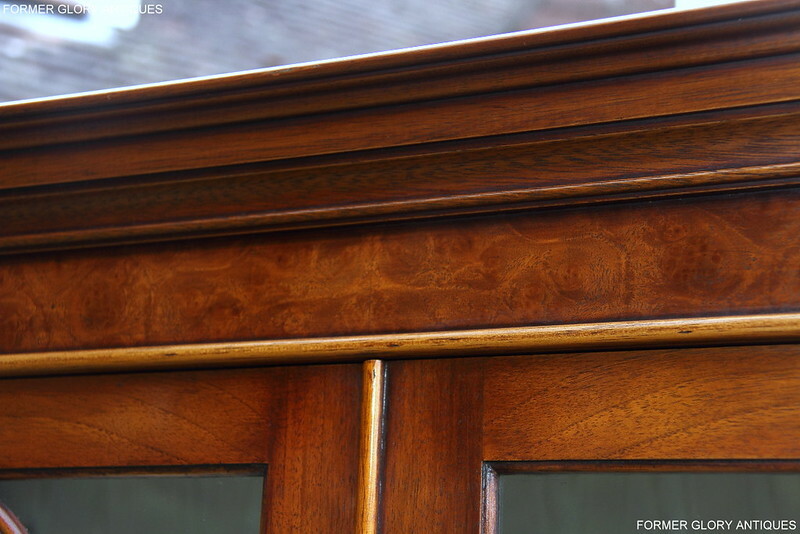 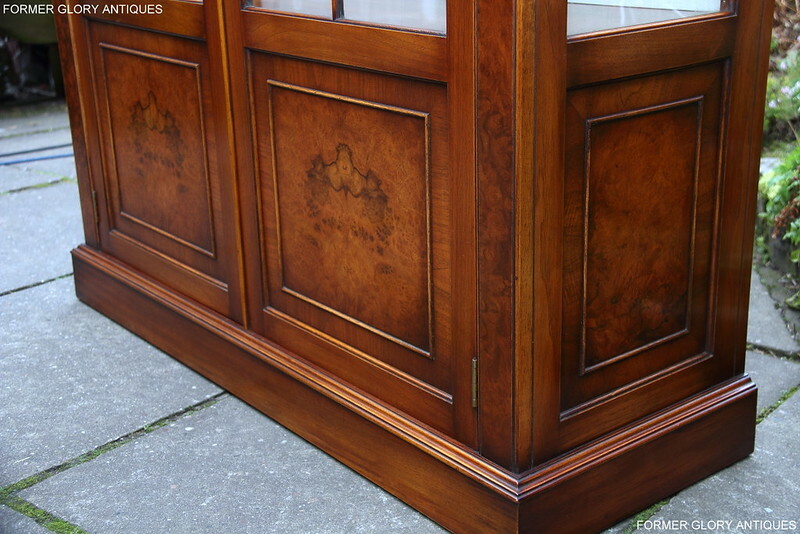 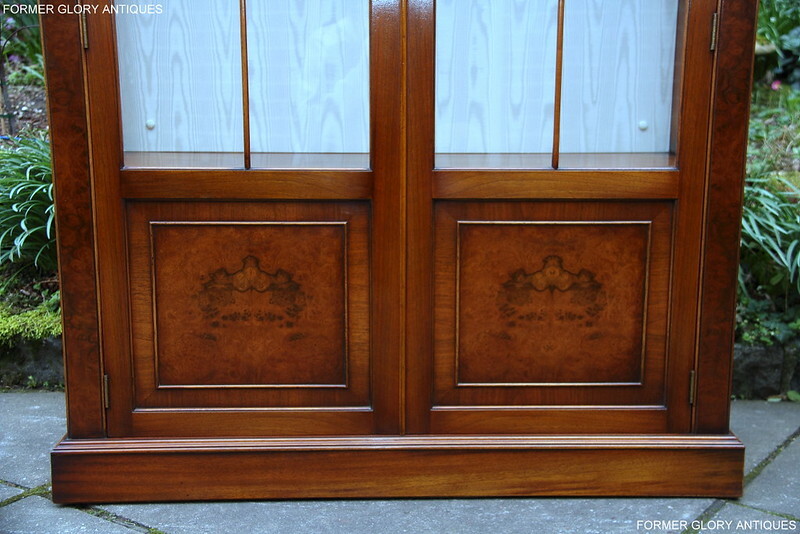 THE TWO LARGE CABINET DOORS HAVE FABULOUS 'GEORGIAN STYLE' GLAZING BARS, WHICH ARE ALL BEAUTIFULLY SHAPED AND ADD REAL QUALITY, STYLE AND CHARACTER TO THE PIECE. 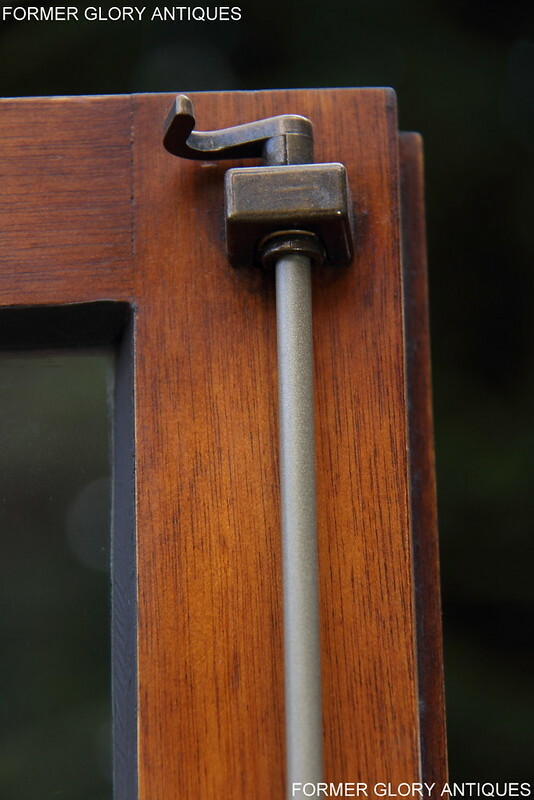 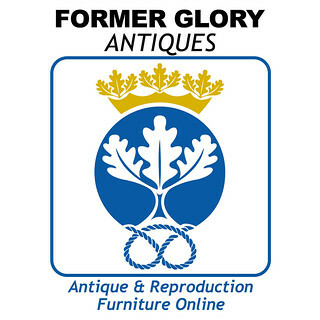 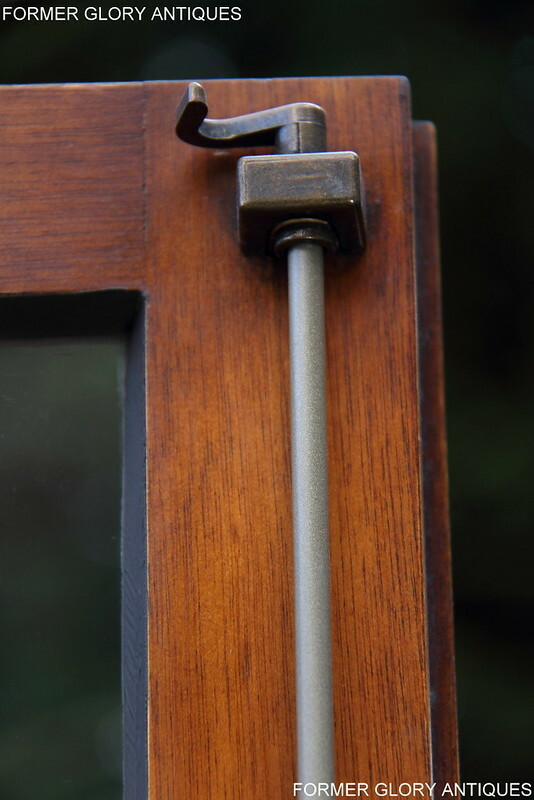 THE DOORS RETAIN THEIR ORIGINAL SOLID BRASS ESCUTCHEON, HINGES AND FULL LENGTH SECURITY 'GRAB LOCK', WHICH IS IN FULL WORKING ORDER AND IT COMES COMPLETE WITH IT'S ORIGINAL KEY. 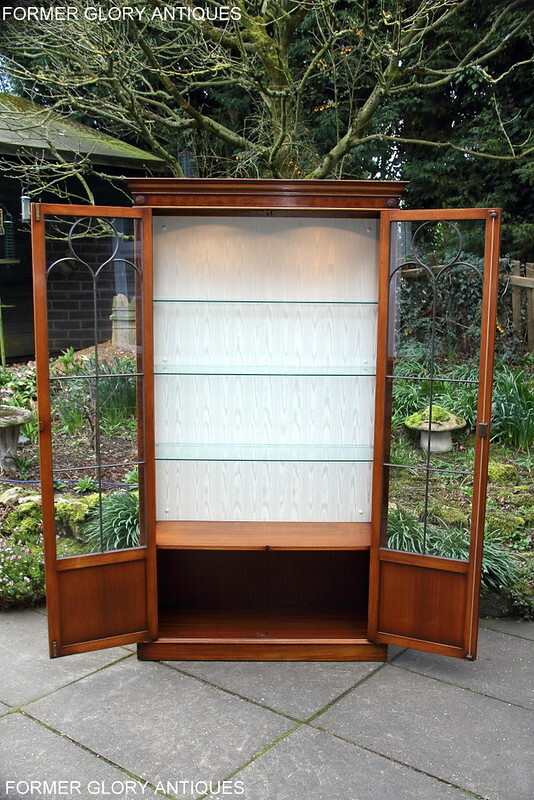 THE TOP CABINET SECTION IS ALSO LINED OUT IN A SUPERIOR QUALITY PALE CREAM, 'WATER MARK' PATTERED FABRIC, WHICH IS IN EXCELLENT UN-MARKED CONDITION. 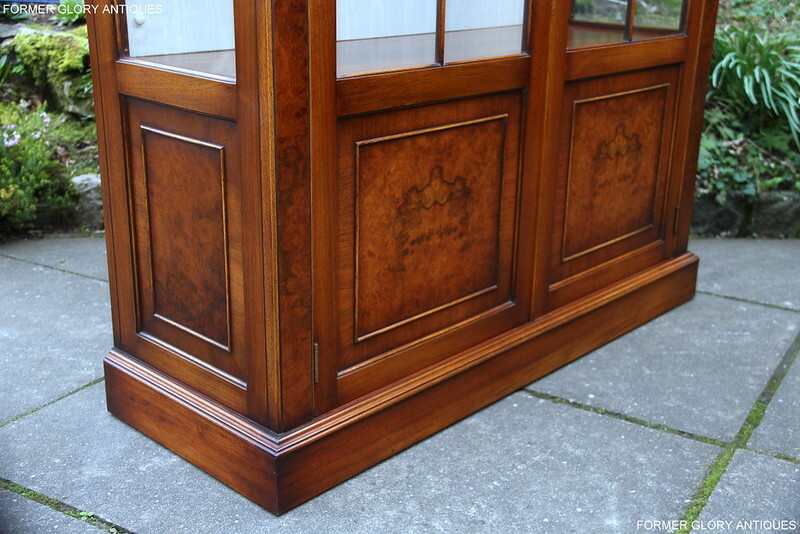 THERE IS A SPACIOUS CUPBOARD SECTION AT THE BASE OF THE CABINET, WHICH PROVIDES VERY USEFUL STORAGE SPACE. 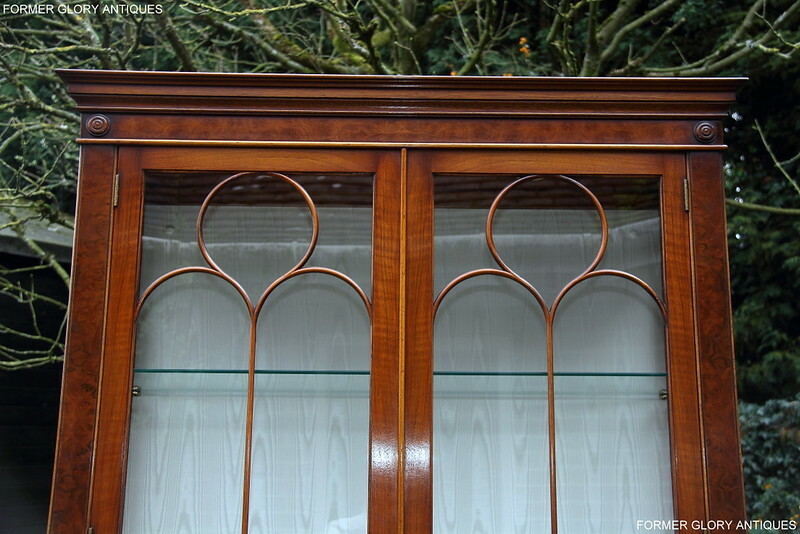 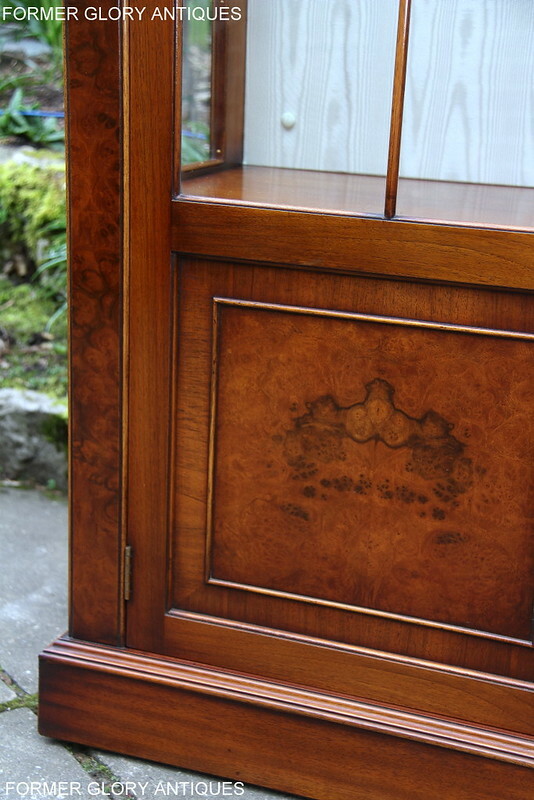 THE TWO FULL LENGTH CUPBOARD DOORS BOTH HAVE BEADED / 'CROSS-BANDED' BORDERS AND BEAUTIFUL 'BURR-WALNUT' INSET PANELS. 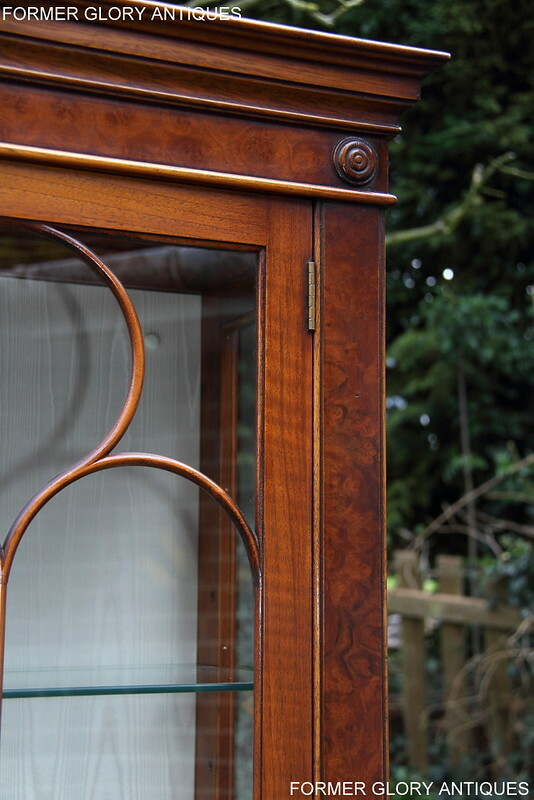 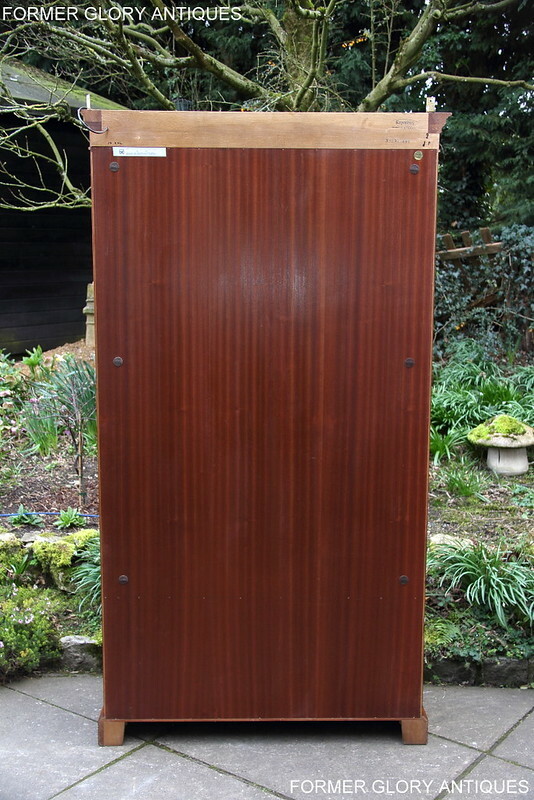 THE CABINET HAS MATCHING INSET 'BURR-WALNUT' SIDE PANELS AGAIN WITH DECORATIVE BEADED / 'CROSS-BANDED' BORDERS AND IT STANDS ON STURDY, 'GEORGIAN STYLE' PLINTH BASE, WHICH HAS A DECORATIVE MOULDED TOP EDGE. 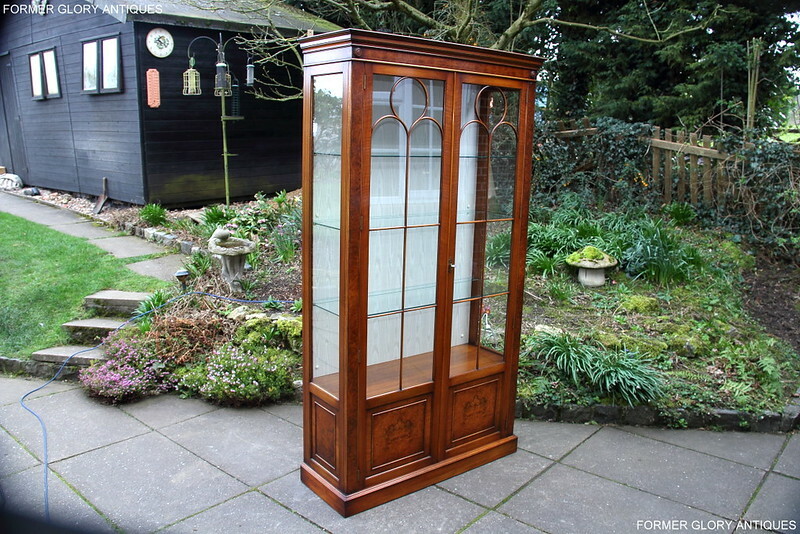 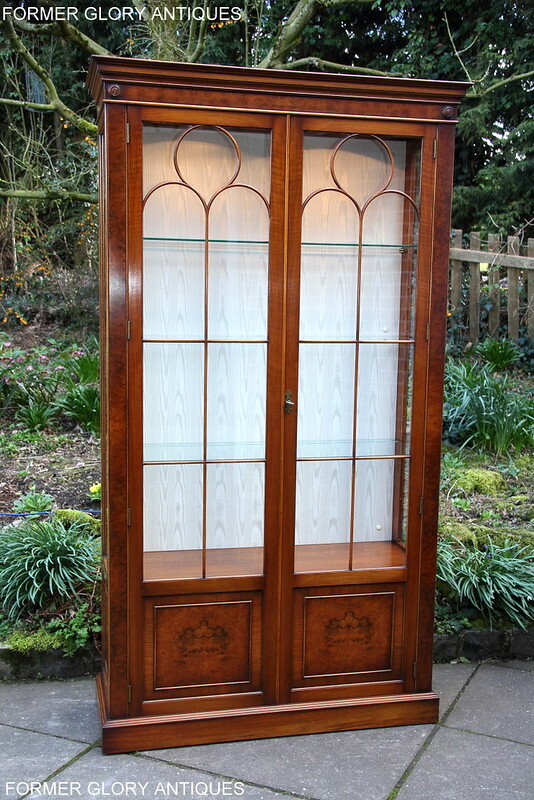 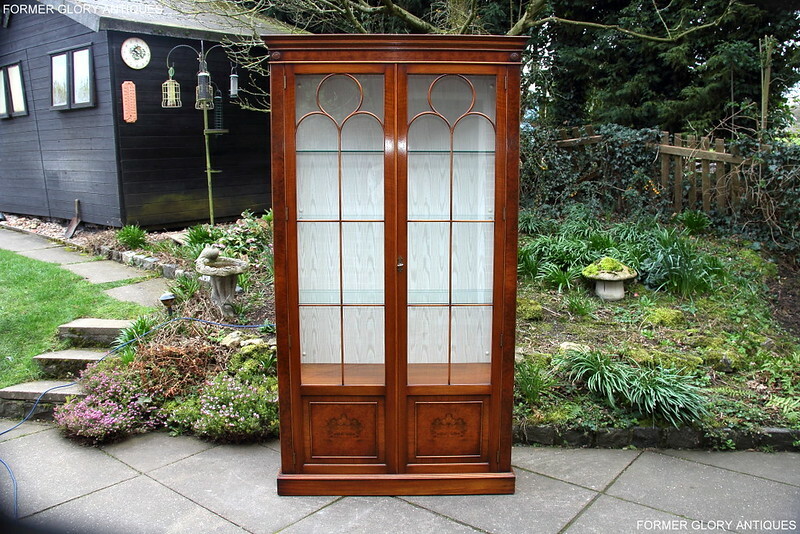 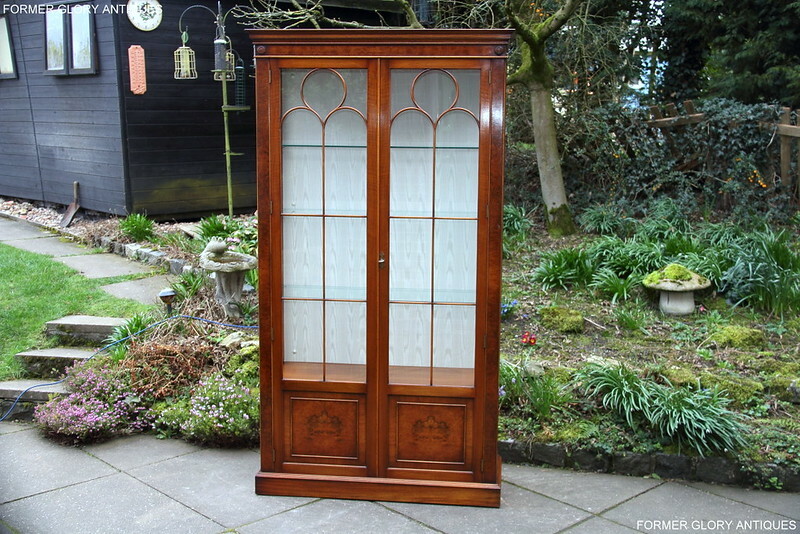 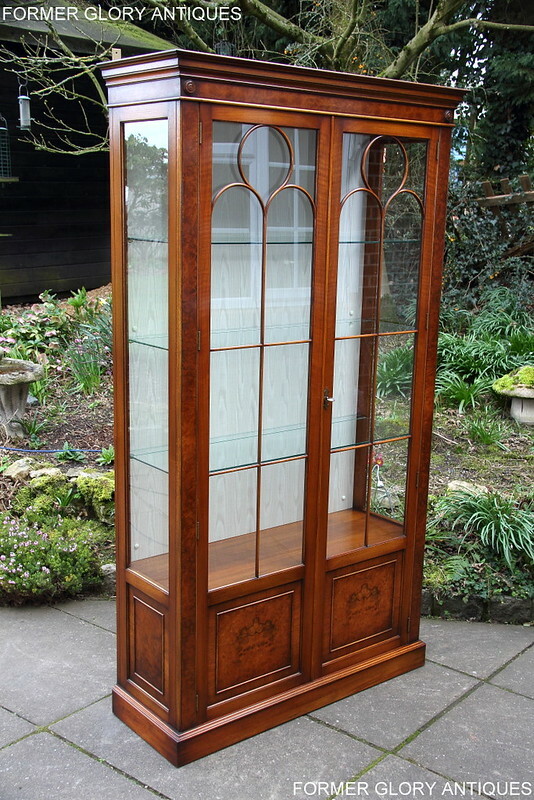 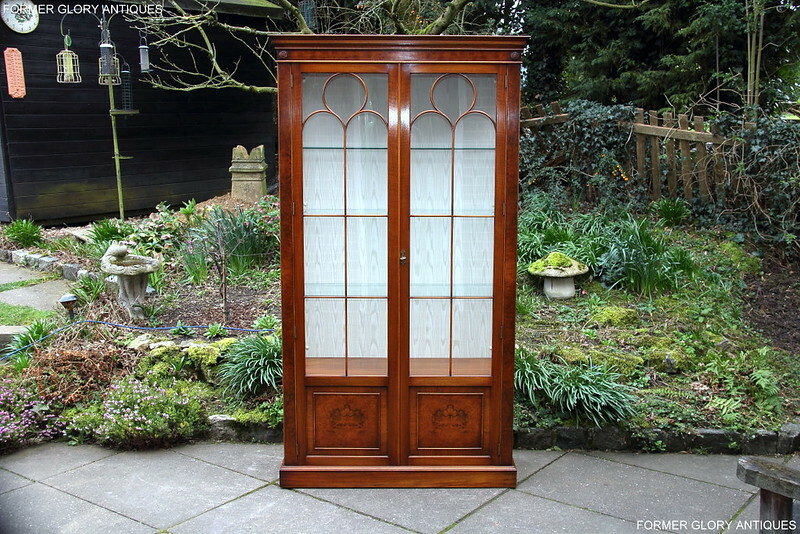 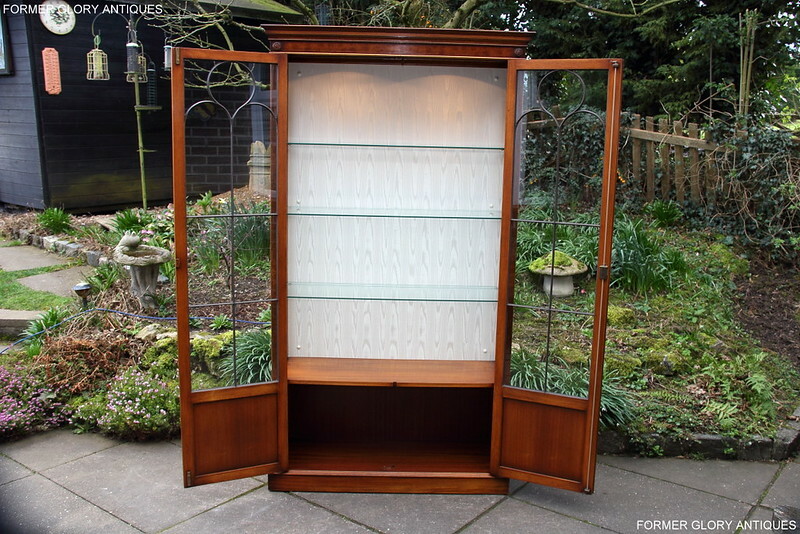 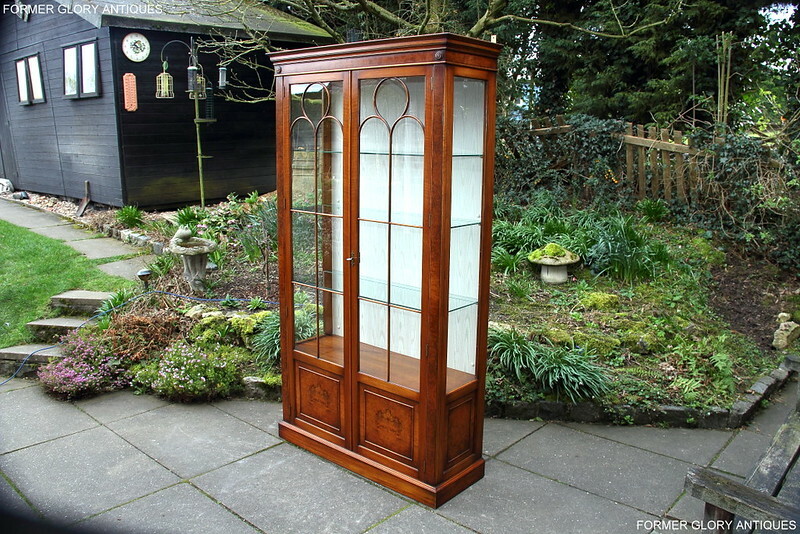 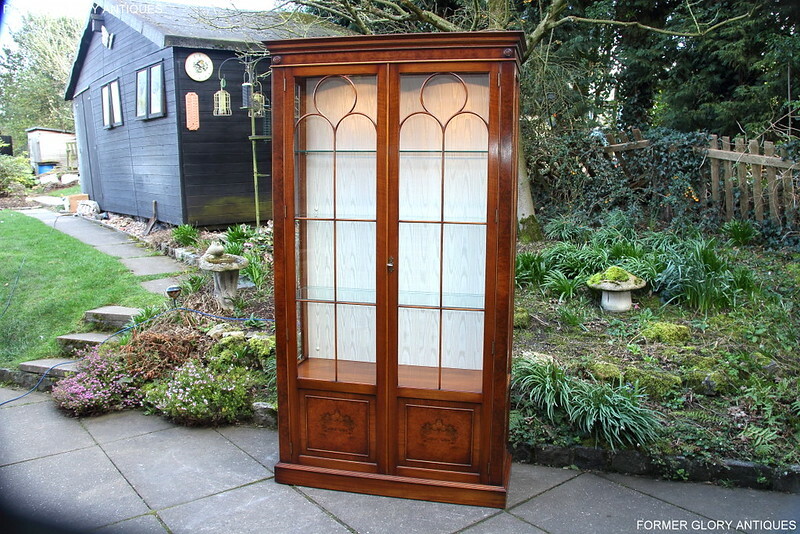 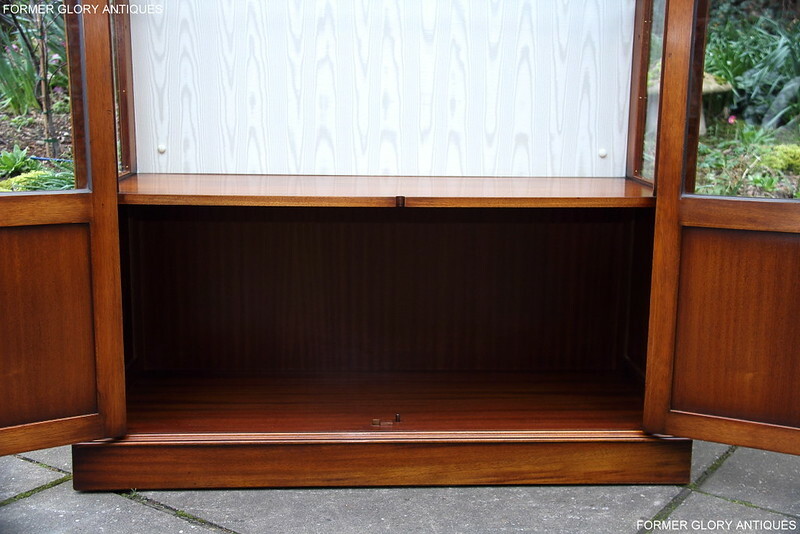 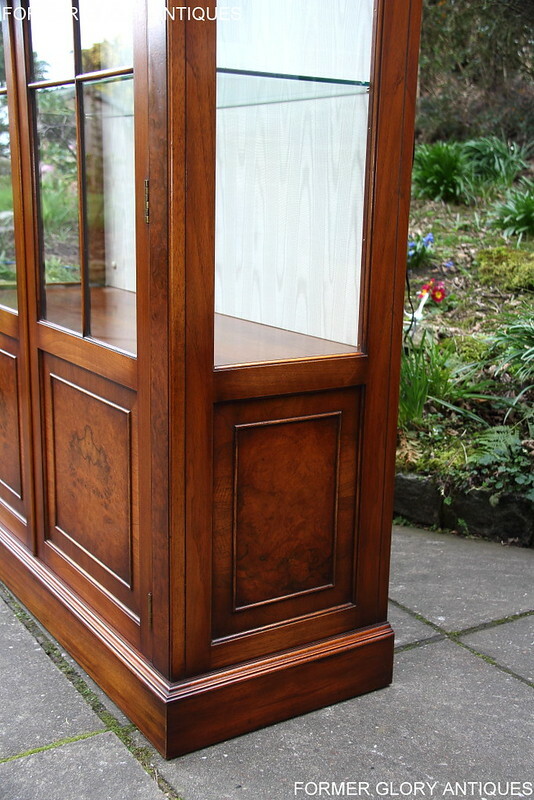 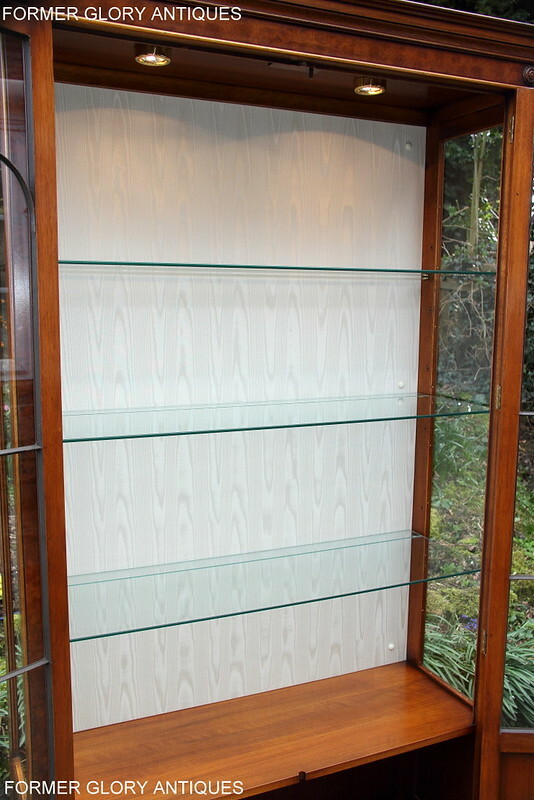 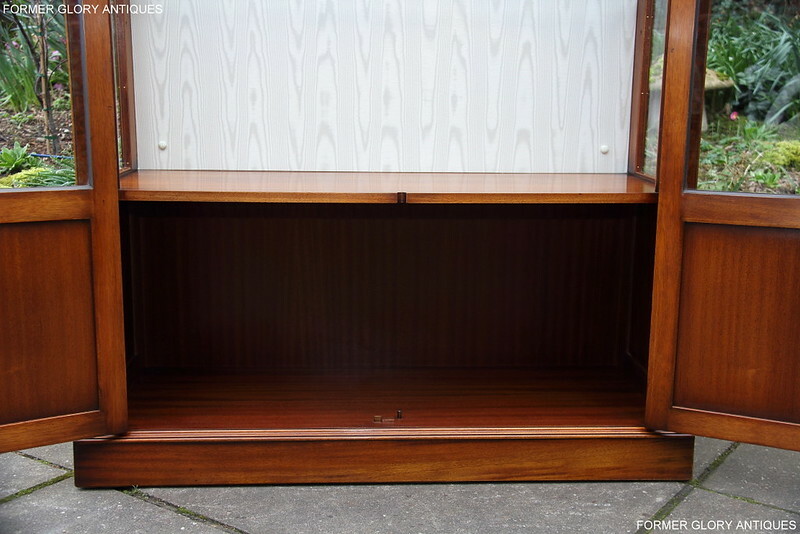 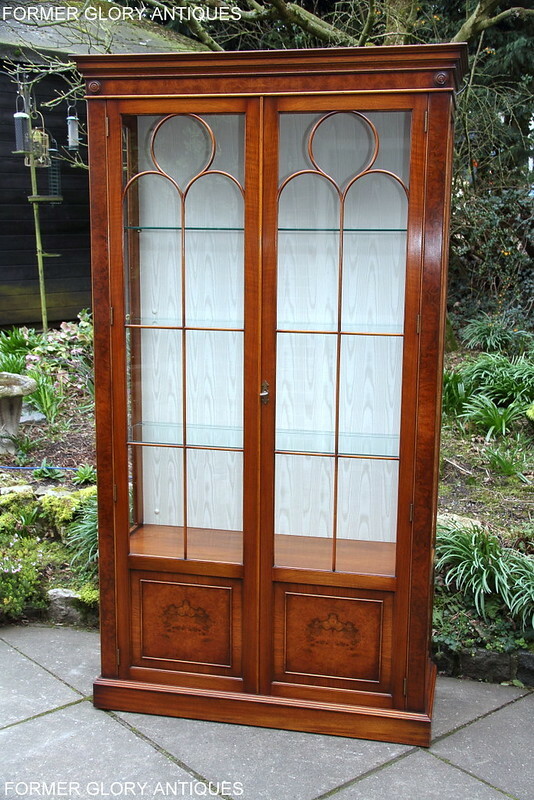 THIS SUPERIOR QUALITY 'BEVAN FUNNELL' 'REPRODUX', 'BURR-WALNUT' DISPLAY CABINET HAS BEEN CLEANED, RE-POLISHED, IT IS IN EXCELLENT CONDITION THROUGH-OUT AND WOULD BE A VERY USEFUL AND ATTRACTIVE ADDITION TO ANY HOME. 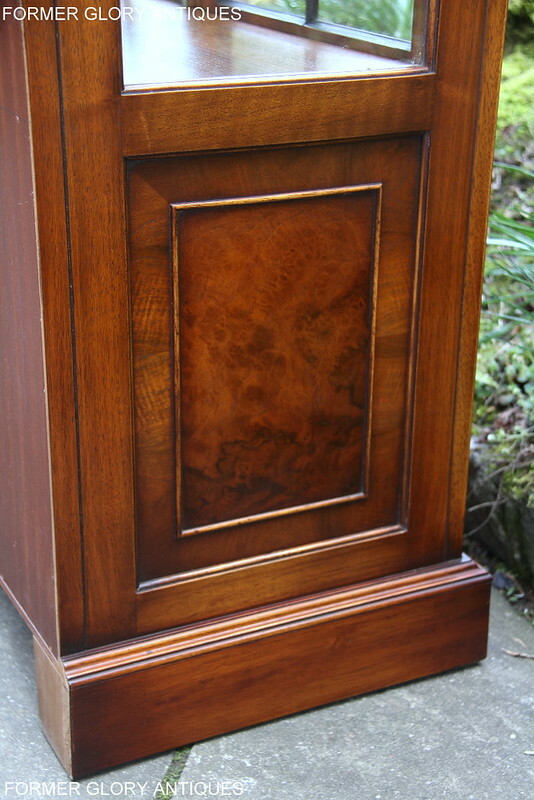 HEIGHT 78 3/4", WIDTH 43 3/4", DEPTH 16".